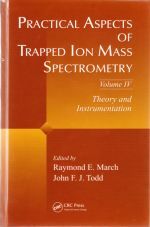 This is the fourth volume of a series of five in total dedicated to ion trap mass spectrometry and related applications. The work presented in chapter 19 is the first demonstration of effective stabilization of thermally labile molecular ions generated by vacuum MALDI and mass analyzed in a quadrupole ion trap. The method described shows how to measure pressure transients inside the trapping volume and also discusses advantages and limitations of ion trap and time-of-flight hybrid instruments.